A couple of weeks ago, my human love slave Karyn took me to a middle school here in Tucson. Ms. Vigo did a lesson on dogs and compassion and since I’m a dog — a greyhound to be exact — I was invited to be part of the lesson. 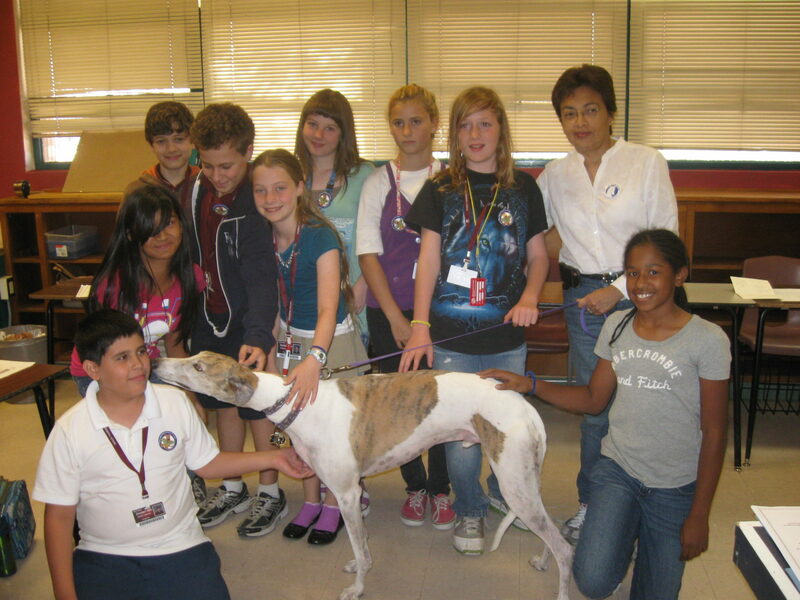 The lesson also included a portion about dog racing and adopting a greyhound. Karyn answered questions asked by the students. The kids were sure smart and loveable. I loved them all and licked most of them. I got so excited I jumped on the principal but she said she didn’t mind. I also poked my nose in all the classrooms with open doors. Greyhounds are nosy, me especially. Karyn was relieved that I didn’t relieve myself in an inappropriate spot. If she’s relieved, then I’m relieved. I hope they invite us back because one of the boys was afraid of dogs until he met me. Life is good here and full of surprises but more about that next time. Jett, you are one popular ambassadog! Glad to see you winning over the world one classroom at a time. My students and I at Doolen Middle School will be inviting you and Karyn back for sure! I’m the little black girl in the photo and Jet was an awesome respectful dog!